The Evergreen Meadows Homeowners' Association (EMHA) annual dues campaign has begun, and letters will be mailed soon to every homeowner's address the last week of September. The 2019 annual dues letter includes a data update form, the president's letter and a covenant proposal ballot which allows all homeowners to vote on 4 proposed covenant changes. The Evergreen Meadows Homeowners Association yearly membership dues of $50 are currently due for the membership year beginning January 1, 2019, and ending December 31, 2019. The homeowner's membership letter contains your account information that we have on file for your address. Please review it for accuracy, make changes where appropriate, and submit it along with your payment to the address shown in the letter’s heading. An enclosed pre-addressed envelope is included with the dues letter and can be used to return with your updated homeowner's information, dues payment and ballot. More ballot information is located below. Annual due Payments can also be accepted via credit card or PayPal on the EMHA website located at http://www.emha.us/join . Changes to your account information are also accepted via email at membership@emha.us . This voting period spans November 2, 2018 through December 31, 2018, and below are the proposed 4 covenants. 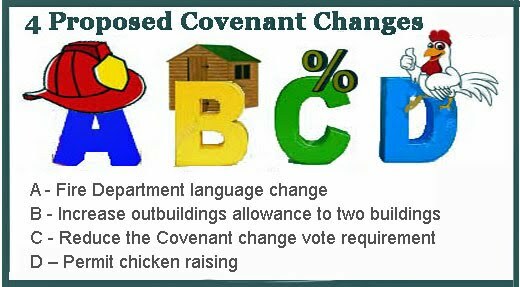 There are 4 proposed covenants that can be changed to 2019 based on a majority instead of a 2/3 homeowner vote return. The EMHA Covenant Change Ballots that are included in the dues letter is available on the website at - EMHA Covenant Change Ballots - as well as attached at the bottom of this web page. Additional voting and ballot submissions options, click on the following --- http://www.emha.us/dues-campaign-ballot . Please feel free to contact the board with any questions at board@emha.us.